CHINA Goldenware Machinery Co. Ltd was Founded in 1993. As a specialized manufacturer of vacuum machine, and meat processing machine and seaing machines for over 14 years, , we have become the predominant OEM factory that produced the products for many famous companies in European and American countries in food processing industry and packaging area. All our products were CE approved by TUV laboratory. 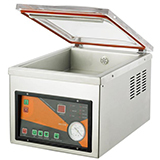 Goldenvac Vacuum machines are available in a variety of sizes, in both tabletop and stand-alone models. All models are made with stainless steel and equipped high quality vacuum pumps for guaranteed reliability and long-term performance.